Religious groups in Ashdod are planning a mass protest later this week against a shopping center that has begun operating on Shabbat. Religious groups in Ashdod are planning a mass protest later this week against a shopping center that has begun operating on Shabbat. The Big Fashion Center of Ashdod said Sunday that despite reports to the contrary, the center will remain open on Shabbat, and that no compromise or change had been reached on closing. Rabbinical and community leaders from Ashdod and from around Israel, as well as from abroad have been pressuring the owners of the shopping center to close the site on Shabbat. The site began operating seven days a week about a month ago, raising the ire of religious residents. 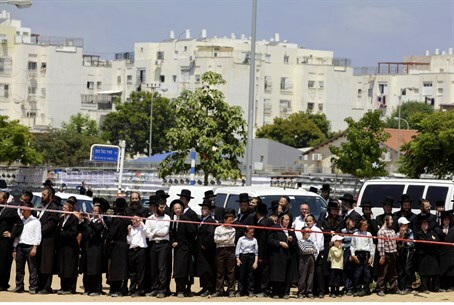 Among the rabbinical leaders who have asked the owners of the site to shutter the operation on Shabbat has been Ashkenazic Chief Rabbi David Lau, as well as a large number of local leaders and heads of haredi communities in Ashdod. The chairman of the Big shopping center chain, Yehuda Naftali, said that he was considering closing the center on Shabbat, but that nothing had been decided yet. He pointed out that numerous other businesses in and around Ashdod were open on Shabbat, and that if those businesses closed, he would certainly close his as well. According to representatives of religious parties in the city, the government coalition that is keeping Mayor Yehiel Lassry in office requires him to act to prevent the opening of any more businesses on Shabbat. In response, the parties said, Lassry has claimed that the shopping center is outside the borders of the city, so he has no authority to close it based on city bylaws.